Very Very Important Personnel (VVIPs ) of India are ferried across the country in special helicopters by the Indian Air Force ( IAF ). For this the IAF has a VVIP squadron equipped with eight Mi-8 helicopters. However the usage of these eight helicopters is generally around 30 percent. Since this fleet is rather old, a requirement has arisen to replace these helicopters. The Service Qualitative Requirement ( SQR ) was worked out by the Indian Air Force for the helicopter to be acquired. SQR pertaining to ceiling for such a helicopter was based on the past experience of carrying VVIPs to various locations within the country. Since some of these locations are in the high Himalayas where high passes have to be crossed, the figure for the ceiling was noted as 6000 meters. It was not until 2006 that a fresh Request for Proposal (RFP) with the same specifications, was issued under UPA-1 to six vendors. Three companies — the makers of Mi-172, Sikorsky, which made the S-92 helicopters and AgustaWestland (AW-101) responded to the RFP. Meanwhile, the Defence ministry put in place a new concept — the Defence Procurement Procedure. Under this, all companies that bid for contracts above Rs 1 billion are required to sign an integrity pact that binds the companies to give an undertaking that no bribes would be paid or that no agents would be used in the contracts. The Russian company that manufactures the Mi-172 withdrew from the competition at an early stage refusing to sign the integrity contract. That left AW and Sikorsky in the race. Since it is not for the IAF to lay down locations a VVIP may want to visit, the ‘ceiling’ could only be amended by those who know of locations that a VVIP needs to visit. Thus this figure was reduced from 6000 meters to 4500 meters. This reduction of the ceiling opened the door for the AgustaWestland helicopter to enter the field. This reduction in ceiling may have been decided in a meeting, but the promoter for this could only be the Prime Ministers Office, which the IAF had no reason to oppose. The second alteration in the SQR is related to the height of the cabin. SQR laid down the height of the cabin at 1.5 meters while the Director General Special Protection Group (DG SPG ) asked for an increase in the cabin height to 1.8 meters on the plea that SPG personnel are above 6 feet in height. This was an absurd requirement, because these SPG personnel were not required to stand in the helicopter to guard the VVIP. However this requirement created a single vendor situation for the AgustaWestland helicopter. The third point of interest in the deal is the number of helicopters required. Once AgustaWestland helicopter was finally selected, the total requirement was jacked to 12 helicopters, again on the bidding by DG SPG. This was again absurd, because in the past, with 8 helicopters the utilization was only around 30 percent. The fourth point of interest is that the trials were carried out not in India, where it was required to be tested across a wide terrain and weather conditions prevalent in the country. However in the instant case trials were carried out in United Kingdom and regrettably not on the AgustaWestland ( AW 101) helicopter but on a ‘representative equipment.’ Now who ordered this and why did the IAF accept such an absurd arrangement is anybody’s guess. In any case by this time Air Marshal SP Tyagi had long retired. As in the case of Bofors gun so also in AgustaWestland helicopter, malfeasance and corruption on the part of Indians in these deals came to light in foreign lands and not in India. As in the case of the Bofors gun, the corrupt ( the then defence secretary, Bhatnagar ) against whom CBI had framed a charge sheet was sent as Governor, thereby placing him out of reach of the long but palsied arm of law, so also in the case of AgustaWestland helicopter. Two of the supposedly guilty have been sent as Governors. 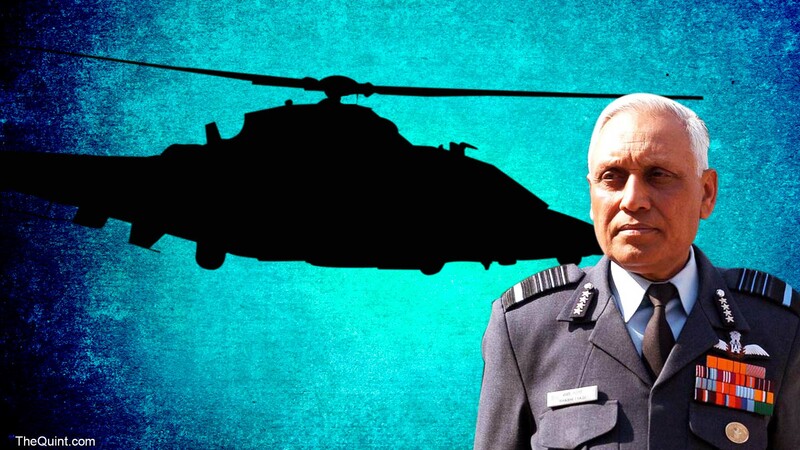 Air Marshal S P Tyagi had nothing to do with either change in SQA related to altitude ceiling for the helicopter to be purchased or altering SQA pertaining to the height of the helicopter cabin. The first change brought in AgustaWestland into the contest and the second change led to Agusta Westland helicopter being the only one meeting this requirement, thus leading to a single vendor situation. If the Air Force had preference for a helicopter with more than one engine, it was merely for greater safety of VVIP. Some of Air Marshal Tyagi’s close relatives were operating as arms dealers and that by itself is no crime on the part of the Air Marshal. Former Prime Minister Atal Bihari Vajpayee’s foster son-in-law too was alleged to have had a similar vocation and yet Vajpayee had little to do with his activities. There are innumerable other such cases. A sheet of paper, listing out, in somewhat coded form, details of bribes paid to various persons and groups in India was placed before the court in Italy. Besides so many others, in this lists air force (a f) is also listed as recipient of bribe money. In this list there is no reference to Air Marshal S P Tyagi as such. The CBI has been investigating this case for nearly three years and has been interrogating the Air Marshal all this while and he has always made himself available for interrogation. However none of the bureaucrats or politicians and some others noted on that list who allegedly received bribes have ever been interrogated by the CBI. Despite no incriminating evidence against the Air Marshal surfacing, he was arrested. The question being raised within the services and the public at large is that why has the Air Marshal been singled out for investigation and subsequent arrest! If in Israel the Prime Minister can be interrogated by the police in a corruption case, why should the concerned officers presently holding the post of Governor not be interrogated and made to face the law of the land. Arresting Air Marshal S P Tyagi was totally uncalled as he has been available for interrogation all this while. His arrest has been a deliberate and calculated step, to further humiliate defence services, keeping in line with the policies of this government. It is an attempt to show them in poor light and diffuse their protests for seeking a fair deal in OROP and grant of NFFU, beside other related issues. Disclaimer : The information, ideas or opinions appearing in this article are those of the author and do not reflect the views of N4M Media. N4M does not assume any responsibility or liability for the same. If the article carries photographs or images, we do not vouch for their authenticity. Next article“Modi Photo On Calendars And Diaries Of State-Run KVIC”, So What?? ?